The Nation had warned when the ship set sail that it probably wasn’t such a hot idea. 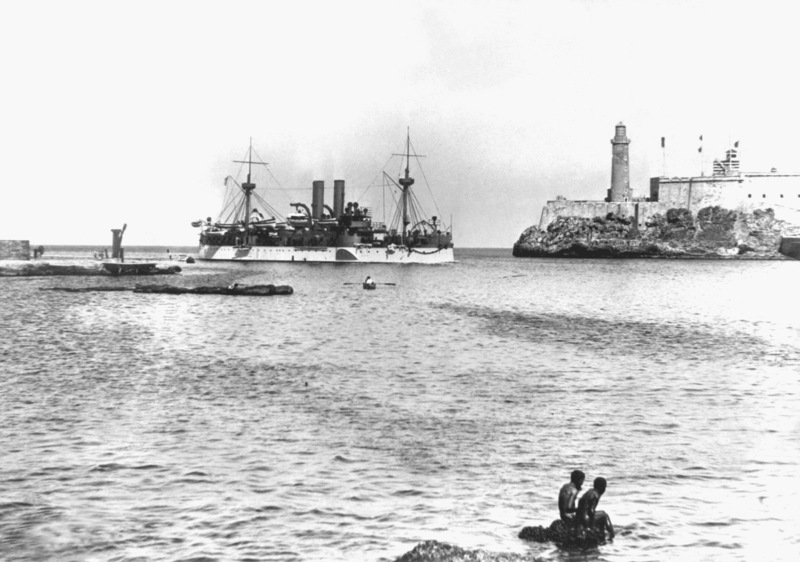 The USS Maine entering Havana Harbor in January 1898. The cry “Remember the Maine!” rallied troops during the Spanish-American War. The ship exploded in Havana harbor, in suspicious circumstances, 117 years ago today. But before the Maine had even sailed for Cuba, the strongly anti-militarist Nation suggested in a January 27 editorial note that sending a warship into geopolitically troubled waters was perhaps not such a hot idea. Gore Vidal once described The Nation as “a journalistic alert-system, warning of dangers too often invisible to even the most alert coastal dweller.” In this case, the praise applies quite literally. The authorities at Washington naturally seek to minimize the importance of the dispatch of a war-ship to Havana. It is only an ordinary routine naval assignment, they say. But time and manner often make an ordinary thing extraordinary, and they seem to do so in this case. No American men-of-war have visited Havana for more than two years, and the reason has not been concealed. We wished not to offend Spanish sensibilities. We also wished not to provoke American inflammabilities. If the reason was good for two years, it ought to be good longer, unless some change has occurred in the situation, which is denied. What the step amounts to, therefore, is a willingness to disregard Spanish sensibilities and to risk the effect on American inflammabilities. What has moved the President to take the step? There is much guessing, but the strong probability is that he was told he had to do something to appease the Republicans in Congress…. The open expressions of joy and relief uttered by Republican Congressmen when they heard of the sailing of the Maine, bear out this view. But they also contain a warning to the President. He must see that if he says A to the Jingoes, he must also say B, or, as one Senator expressed it, fill Havana harbor with war-ships. If the Spanish are excitable, what is our press, what are our Legislatures, our Congress? A war-ship is a curious kind of oil on troubled waters, though the Administration would have us believe the Maine to be about the most unctuously peaceful ship that ever sailed.